Donna Souza-Postles and family established La Garza Cellars in 1991. The property had once been Jonicole Winery, which operated from 1973-1980’s. Sections of the vineyard were originally planted in 1968. A prominent feature of the label was a Heron. The winery produced about 2,000 cases per year. A variety of wines were sold but Cabernet Sauvignon made from the 1968 vines won multiple gold medals over the years. The winery was located at 491 Winery Lane, Roseburg, Oregon 97470. 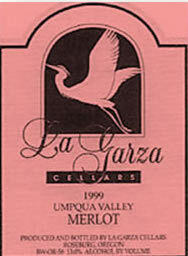 La Garza Cellars was sold to Spangler Vineyards in 2001.